WASHINGTON — To hear President Trump and his attorney general explain it, the epidemic of urban street violence in the United States stems from highly organized gangs of immigrants. 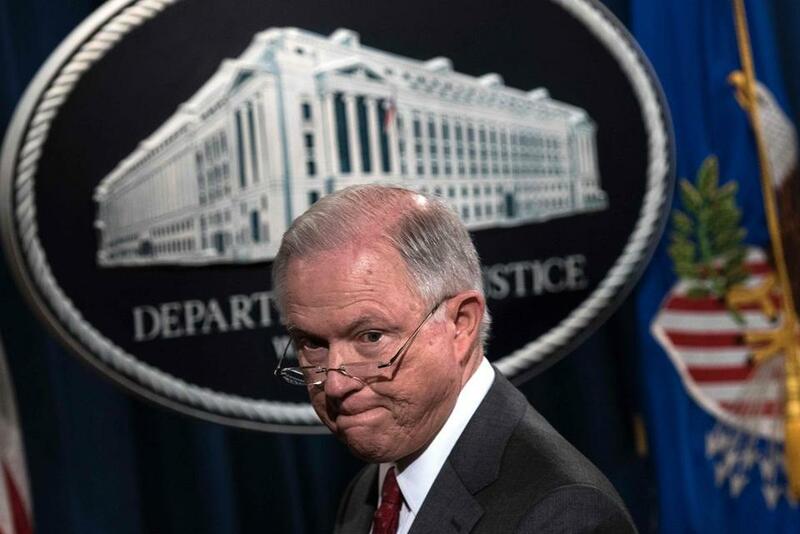 Attorney General Jeff Sessions, in a recent speech in Boston, targeted MS-13, a notoriously violent gang that originated in Los Angeles but has Salvadoran roots, with heated rhetoric and called for combating the group with stronger immigration enforcement. But many criminologists say this is a disturbing and misleading diagnosis of what’s causing violence, one designed to instill fear. In their estimation, the reality of the country’s murder rate in urban communities is more complex, reflecting hundreds of killings per year by individual young people or loosely organized local groups with no broader reach. That wave of violence has little to do with stereotypical kingpins ordering hits on the streets, say criminologists. Antigang advocates in Boston, Chicago, Baltimore, Detroit, and elsewhere said MS-13 is responsible for a small percentage of overall gang violence in the United States and operates in a more formal, hierarchical structure than most modern gangs. Kennedy singled out Boston, where MS-13 has been responsible for about 4 percent of homicides in the past three years, to demonstrate the disconnect between political rhetoric and reality. Some especially grisly MS-13 murders — including the use of machetes to hack off victims’ heads and limbs — have made the group a perfect political target for lawmakers, Kennedy said, but the reality remains they are not the chief priority of people who study gang violence. Most gang-related crime is committed by natural-born Americans — not immigrants — and a city’s sanctuary status has little to no impact on crime, according to a 2017 study conducted by the University of California Riverside whose findings have been misrepresented by Sessions. Sanctuary cities is the informal term used to describe local governments, including Boston’s, that have decided against actively aiding federal immigration authorities in rounding up undocumented residents. They are a frequent target of the Trump administration’s ire. “This is the first administration, the first Justice Department, in which promulgating errors [about gang violence] is so central to their platform and policy positions,” said Kennedy, a gang policy specialist who has worked with Republicans and Democrats. “My expectations for [this administration] weren’t very high and they haven’t even met those,” said Carl Taylor, a youth violence specialist in Detroit and professor at Michigan State University. “Securing our border, both through a physical wall and with the brave men and women of the Border Patrol, and restoring an orderly and lawful system of immigration is part and parcel of this antigang strategy,” he said. In late September, the White House proclaimed a “National Gang Violence Prevention Week,” a designation that did not exist during the Obama administration. In the proclamation, Trump again tied a recent spike in homicide rates directly to MS-13 and immigration. Community programs and other prevention efforts have attempted to curb this violence, but with uneven results. Experts said structural factors such as poverty, segregation, poor community-police relations, and easy access to weapons can also instigate homicide. But dealing with those issues is an enormous social and political challenge and requires a far broader approach than anything Trump has proposed, they say. In Boston’s Suffolk County, an area that has experienced its fair share of highly publicized MS-13 related violence, attorneys have, so far, linked the organization to about six murders in the region from 2014 to 2016. That’s a fraction of the homicides that occurred over that time period in that area — about 4 percent of the 162 total homicides. Alex Goldenberg, an antiviolence community organizer in Chicago’s South Side, said he felt the administration’s rhetoric boiled down to “racist dog whistling,” a singling out of young black and Latino men that fits with long-held racist stereotypes. In an interview, Goldenberg said he hoped Trump and Sessions would make time to come to one of the supposedly gang-ridden communities they deride. Spreading misconceptions about crime and gang violence is a bipartisan tradition in American politics dating back decades. In advance of President Bill Clinton’s 1994 crime bill, top administration officials as well as first lady Hillary Clinton spoke, without evidence, of “superpredators” in inner cities, a term that she later apologized for using. Gang violence experts have also criticized former presidents, including President Barack Obama’s administration, for not adequately investing in antiviolence initiatives or talking about the problem in ways that foster collaborative solutions. Dr. Leanna Wen, an emergency surgeon and current public health commissioner of Baltimore, said the Trump administration must come to see violence as a community disease, similar to how it treats opioid addictions or other public health problems. Astead W. Herndon can be reached at astead.herndon@globe.com. Follow him on Twitter @AsteadWesley.